This rig is done and ready to ship today. 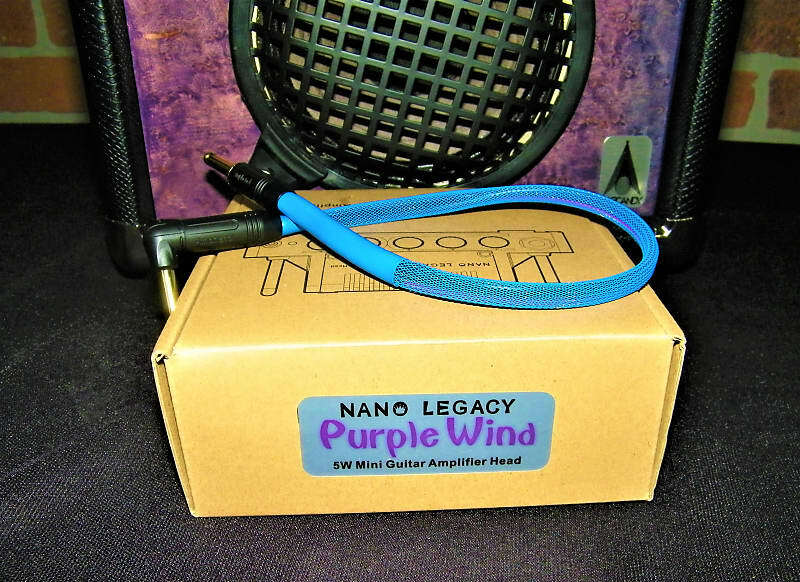 Purple Wind is a 5W Class AB Guitar Amplifier Head. It captures the tonal characteristics of the legendary Plexi Super Lead. With 3-band EQ and Gain/Volume control you're set for classic rock on the stage or at home. The amp is brand new, the box was opened only to take pictures, it comes with the power cable and everything that is supplied by the manufacturer. 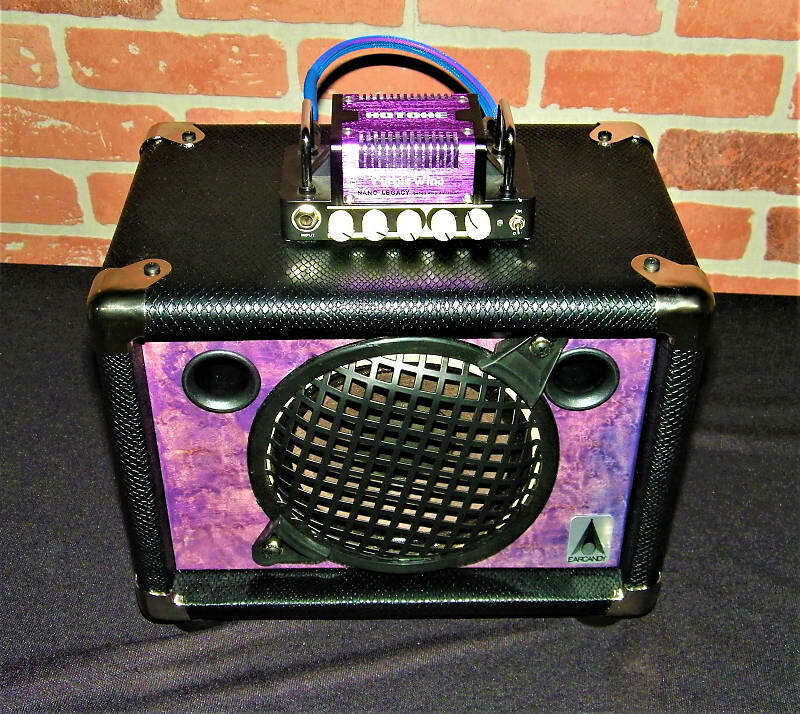 The Mini 1×6 is a large sounding cab with a wide sound dispersion. 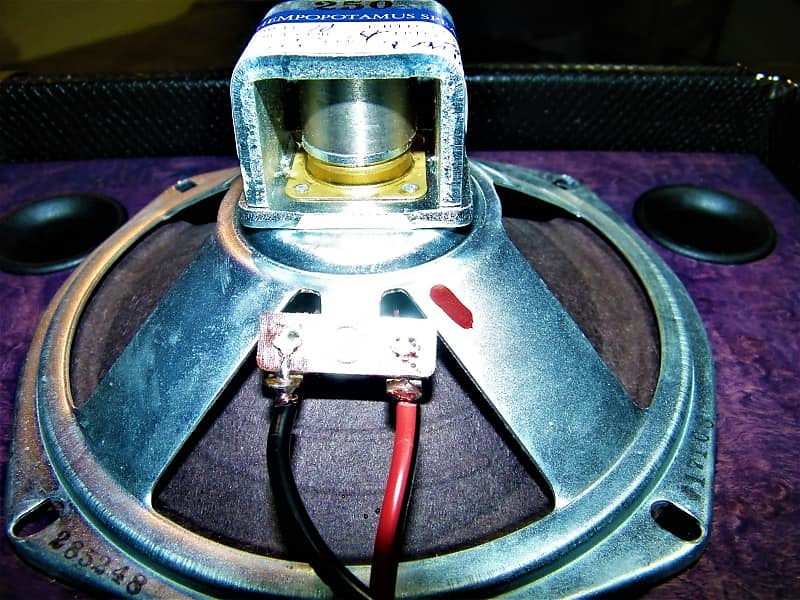 It is perfect for those .5 to 25 watt tube amps because the cab is fast reacting with a lot of clarity. 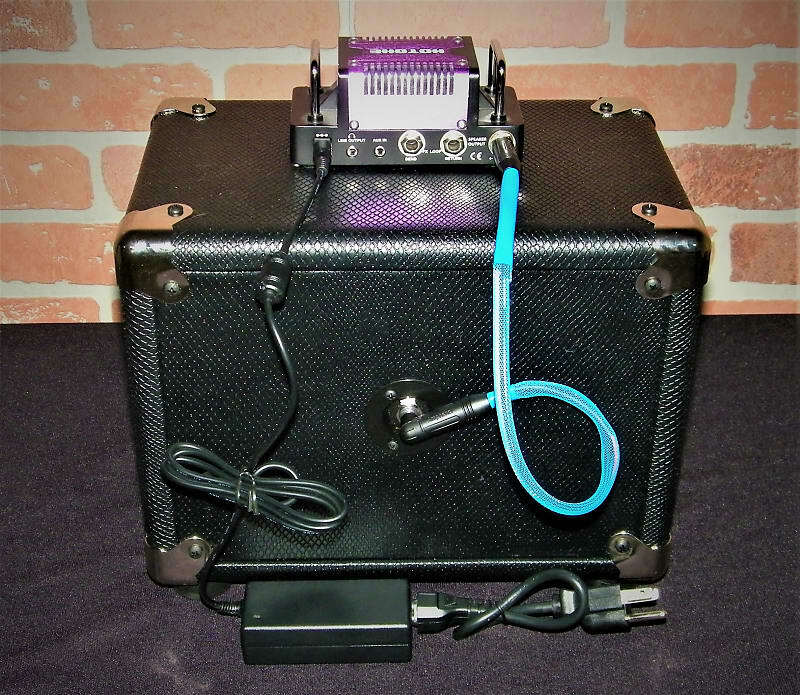 This cab lets your amps tone shine through and does not color your tone. The 1×6 has plenty of Bass, Mid’s and Highs and is very perceptive to changes in your amps tone stack or Eq. We designed this to deliver the same kind of tone our 1×12 Sovereign cab delivers but at lower volume levels. This cab design gives us the ability to create a large tone at lower volume levels where you can push your amp and get lots of volume and tube tone. 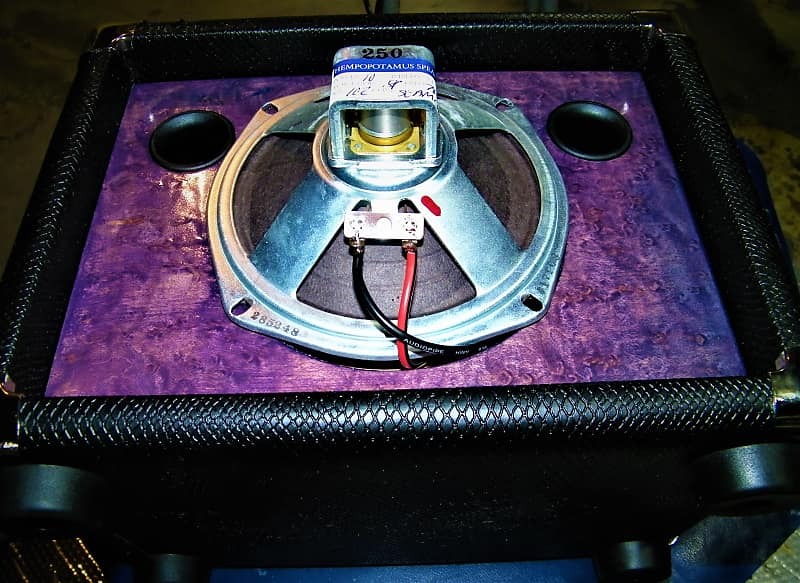 EarCandy’s Twin ported baffle allows the speaker to breath with the air coming in and out of the cab. Because of the way the porting works, the speakers are floating, they don’t have to fight gravity or air pressure. They get exactly what they need which allows for more warmth. sustain, tone, clarity, volume and sound dispersion. Our cabs are not beamy. Because of our porting design, the entire area in front of the cab is the sweet spot. The cabs are warm but do cut through, you can use it with a drummer and bass player and be heard with no issues. You will notice a 180 degree sound dispersion so when you walk around the room the cab will sound the same. You do not have to be directly in front of the cab to audibly benefit from the tone of the cab. 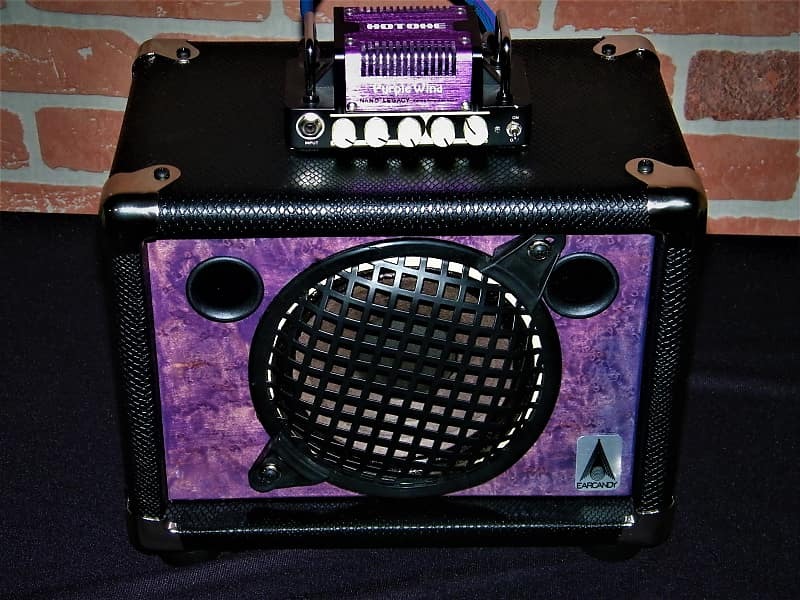 Because of the Wood’s used, Ceramic speaker and the tuned porting, this little cab will stun you with its ability to deliver many styles of tone at moderate to loud volume levels. 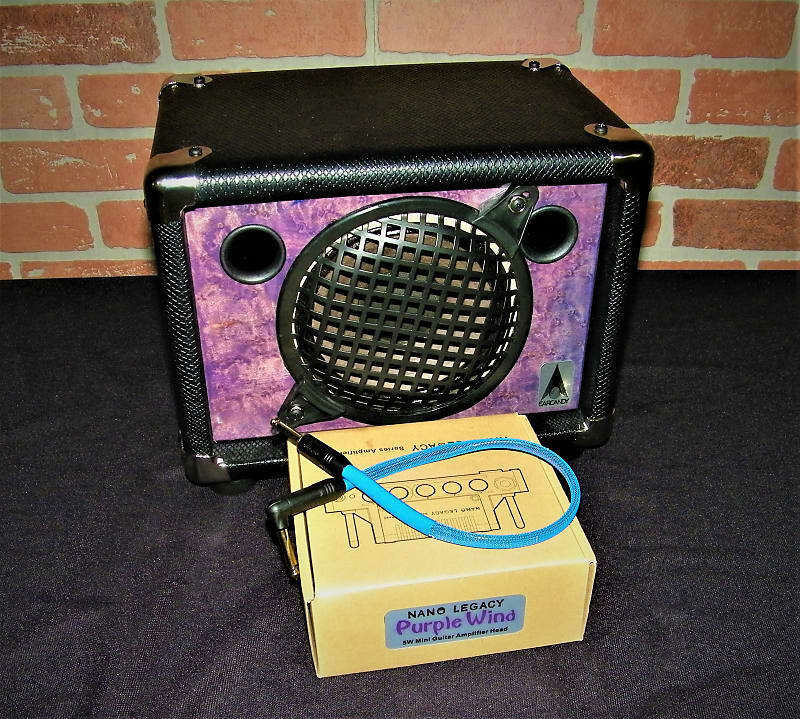 This cab is absolutely perfect for those little 1/2 to 25 watt tube amps where you want to hear the crunch and tube break up without having to use attenuation. It has very nice, well rounded cleans, with the bell part of the tone complimented by the cab, bluesy over drive tones are smooth and crystal clear. Heavy, more saturated distortion tones are thick and chunky with a lot of harmonic capability and sustain. Palm mutes and heavy de-tuned tones are clear, concussive and tight. We ship our smaller items the same business day if they are ordered before 3pm CST. (Except Civilian and Government Holidays). We use USPS mail which is usually a 3-5 day ship time. This cab is done and ready to ship today. The items must be returned back to us un opened and un tampered with before we can issue a refund or replacement. Buyers are responsible for the return cost and outbound cost if you are exchanging for cosmetic reasons. ALL of our items are inspected and tested so you will not receive a defective product. 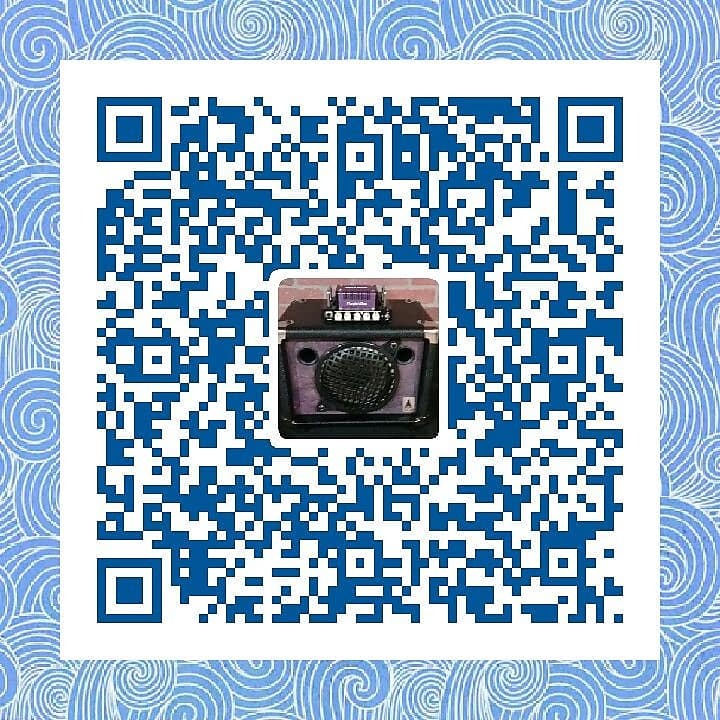 If you receive your items and they have been damaged in shipping, we will ship out the same item or item of equal value at no cost to you After we receive pictures of the shipping damage. Of our items have a lifetime warranty against manufacturer Defects. We thrive on providing excellent customer service. Your feedback is extremely important to us and we will leave feedback for you after we receive feedback from you. If we have not given you 5-star service, please let us know immediately so we may rectify the situation for you and earn your return business & 5-star rating before submitting your rating. All our messages are answered the same day except weekends and holidays. Messages about items on Reverb MUST be sent through reverb. We greatly appreciate your business and it is our goal to provide outstanding service with the highest quality products. Thank you to Reverb and Thank you for checking us out. This particular cab is done and ready to ship today. A quick note about our Pre-Build status. This is put in place to give us time to manufacture the highest quality product for your needs and so that our clients are not stressed out thinking their item has already shipped. Typically we put an 8-10 day pre build on our cabs. We build the highest quality cabs money can buy and we do not cut corners. Please don't be alarmed at the 8 day pre build time. Our staff is here 5 days a week 10 hours a day and getting your product to you in a timely fashion is of utmost importance to us. We are honored that you use our gear and do not take build quality lightly. This particular cab is done and ready to ship today. We are closed for the day for Good Friday and the Easter Weekend so our small group of people who work with us can enjoy an afternoon and early differ with their family. We will be returning monday morning at 9am. Thank you and please have a great Easter Weekend! We ship our small items the same or next day. Our post office is small, often overwhelmed and understaffed. Even after our shipments have been picked up and scanned, they will not track for up to 24-36 hours. Sometimes the Reverb.com shipping progress meter never updates past “status unknown” or “Label created”. If you click on “Purchases” under your menu icon, you will see all the items you have purchased here on reverb. In the lower left-hand corner of each purchase window, you will see a shipping status link, right click on that, then click on “open link in new tab”. This will open a new reverb page that will show your tracking number, left click on that and it will take you directly to the USPS website which will show you the status of your shipped item. Please keep in mind, this is often approximately 24-48 hours behind the actual tracking / location of your item. We utilize Reverb's pre build system to give us time to pay attention and spend time on every detail of our cabs. In order for us to me able to do that, you will receive a tracking number shortly after your order is placed. This does not mean that your order has shipped. When your order ships, we will message you with pictures of your cab along with live tracking from UPS. Most of the day, we are all in the wood shop, assembly room or shipping department. You will be the first one to know that your item has shipped. EarCandy is a family company that has revolutionized Guitar & Bass audio speaker cabinets and wiring. Established in 2002, we evolved American made speaker cabinets from unnecessarily oversized, overpriced and overweight typical designs that your granddad used, to light, affordable and road worthy world class tone machines. All materials are obtained from American manufacturers, with our gear designed and carefully handcrafted in Indiana. Our gear is scientifically hand made with the highest quality components money can buy. Including tone woods, speakers made in the USA, and a choice of options to personalize your tone, personality and presentation. Every piece of your gear is created with road worthy experienced artistic application & functional perfection. We are open from 9am -5pm CST Monday through Friday and we are closed on holidays. We are open Monday - Friday from 9am - 5pm CST. 9am to 5pm CENTRAL STANDARD TIME, PLEASE DO NOT EXPECT MESSAGES TO BE ANSWERED BEFORE 9AM AND AFTER 5PM. 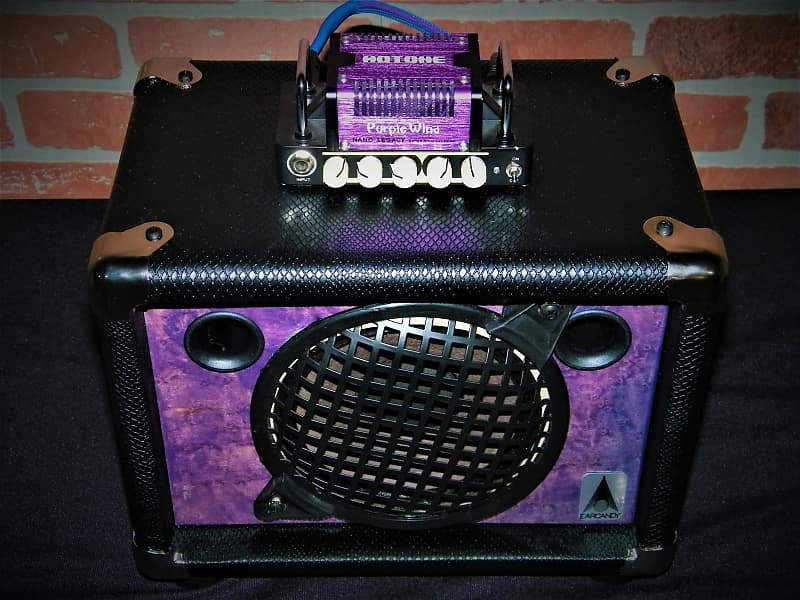 All of our guitar and bass speaker cabs have been in our product line up for over a decade. We do not use staples, glue and multi ply mystery wood. All of our guitar and bass cabs and speakers were designed by our lead design engineer Tim Paulsen, which is who answers all of our correspondence here on Reverb. Our Guitar and bass speaker cabs have been in use by professional level and celebrity level musicians for years all over the world. We do not offer custom dimensions or variations on the options available. Please feel free to message us here through Reverb.Com with any questions about our products. Ear Candy has been building and selling gear for musicians around the world for over a decade. Our cabs have a lifetime warranty on parts, workmanship and technical advice pertaining to the use of our products. Our proprietary patent pending designs set us apart both in looks and tone. When You need the best, you can rely on our tried and tested cab designs to deliver the best tone you have ever had. We do our best to ship our accessory items within 24 hours or less from the time the payment clears. If an item is posted, it IS in stock and ready to ship with the exception of pre-build items which are only cabinets and speakers. The items must be returned back to us unopened and untampered with before we can issue a refund or replacement. Messages are answered in 1 business day except weekends & holidays. ALL EarCandy© item descriptions, specifications, and pictures are copyright protected by the DMCA and are the intellectual property of EarCandy© and may not be used in any way without expressed written permission. Due to the large amount of cab orders and the complexity in which they are built, it is no secret we run late on orders from time to time. Over the last 3 days, including Sunday, we have been inundated with questions like “Did it ship?” “Is there any progress?” and “What is the status?” 90% of these questions are being asked before the items actual ship date. We are diligent to adhere with Reverb.com’s policy that all questions be answered in a timely fashion. At any given time, we have upwards of 70 builds, and orders going on at one time. This last weekend we calculated the time that was taken out of the shop to answer status messages. The time taken from production, and shipping was 13 hours, which over the course of 2 days is 26 hours total out of production. If you check our feedback, you will see we ship all of our items as quickly as possible. We ask that you please refrain from sending status questions as it does delay your order as well as the orders of others. When it ships, you will be notified with live tracking, and if you ordered a cabinet we send a few pictures of your actual order. Our goal is to pack and ship the highest quality items as quickly as possible. Technical emails will be answered daily. We appreciate your understanding in this matter. If you have an order with us, it is being worked on.